There are many types of bears on our earth. 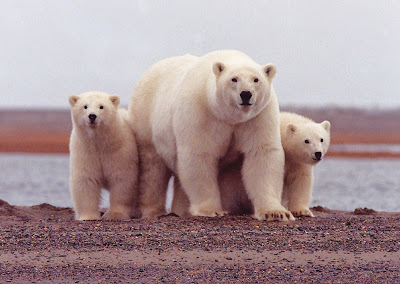 One of the most iconic is the polar bear (ursus maritimus). It is one of few creatures that live in the Arctic. It is a large and powerful animal with many interesting characteristics. It is the largest bear yet lives in one of the most desolate climates on earth, the frozen Arctic. The average weight of a polar bear is about 1000 pounds (450 kg). When they are born, cubs weigh just 1 pound (0.5 kg). Polar bears have a keen sense of smell and are able to smell food up to 20 miles away. They are also excellent swimmers. As Christians we often try to appear Christian to those around us. We have a tendency to try and make ourselves look virtuous to others. We want them to see that our faith is genuine or that we are better than they are. In fact, you may even be doing so right now. Jesus’ own disciples were guilty of trying to show-off their goodness. This is not how Christ desires us to live. As Christ’s followers, we live to please him alone. We are called to share our faith with others, but we must do this by living transparent lives focused on pleasing Christ alone. We must live honestly, not trying to appear better than those around us because we are not. We are just as undeserving of eternal life as non-Christians. It is only through Christ’s forgiveness that our sin is removed. When we live wholly focused on Christ, then we become transparent and others will see Christ’s light in us rather then our own. Have you ever tried to look like you were a good person? Are you willing to share? What are some ways that we can focus on Christ in our life rather than on the approval of others? 1 Tanya Lewis. “5 Weird Facts About Polar Bears.” (February 27, 2014). Livescience.com. Accessed December 28, 2017 from https://www.livescience.com/43673-weird-facts-about-polar-bears.html.